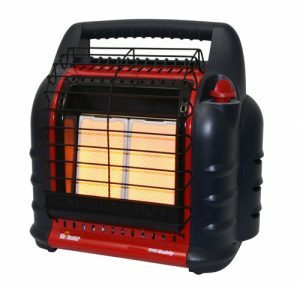 If you are looking for a tent heater for camping, you are most likely looking to find a tent safe heater. Many campers who want to use heaters for camping tents in the colder months including winter, are looking at safe, portable, propane tent heaters and tent wood stoves. 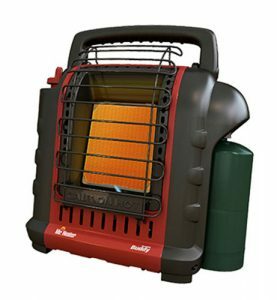 We have researched all the safe and portable options and recommend the Mr. Heater Portable Buddy Propane Heater as your best option for a propane camping tent heater. In addition to our best tent heater pick, here are some other tent heaters and tent wood stoves for specific camping heater needs. The Mr. Heater Portable Buddy Heater is the best propane camping tent heater for sale and should be your top pick especially if you’re looking for a safe and portable tent heater. 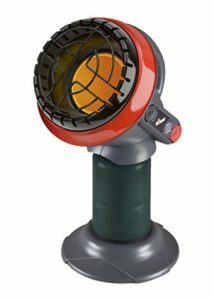 This particular model is not only a Best Seller on Amazon but also North America’s Most Popular Portable Propane Heater. 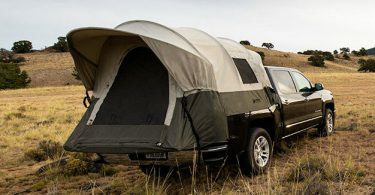 Uses include not only most typical tents, but also larger ice fishing shacks and tents, hunting blinds, and even outdoor spaces. The features that make this such a safe tent heater is the Oxygen Depletion Sensor (ODS) and accidental tip-over safety shut-off. While these are great safety features, we recommend reading all of the instructions carefully and making sure your camping tent is properly vented. Additional features include: 4,000 or 9,000 BTU per hour (runs approximately 4-5 hours off of a 1 lb. propane cylinder). Heats up to 225 sq. ft. Single control start knob and includes a Piezo igniter. Hi-Low heat settings. Swivel regulator. Fold down handle. We have some further recommendations to make using our top pick a great experience. If you plan on using your heater for an extended period of time, this heater has the option to be connected to a 20 lb. propane tank. The accessories you will need to do so are: Mr. Heater Buddy Series Hose Assembly as well as the Mr. Heater Fuel Filter. When using a large propane tank, you’re going to be tempted to run the heater overnight. While we don’t recommend doing so, if you will run the unit while sleeping, we recommend making sure you vent your tent properly and taking along a battery-powered CO sensor and alarm like the First Alert Carbon Monoxide Alarm. You’ll need something to keep your tent heater off the tent floor. The immediate area in front of the heater warms up and it could melt your tent floor. Your options are a simple metal step stool like the Eva Medical Step Stool. While these step stools are relatively cheap and sturdy, we prefer folding models that store easily with your camping gear and at home. Our favorite option is the Camco 43676 Adjustable Height Aluminum Platform Step. This stool is not only foldable, but has adjustable legs that allows you to adjust to the height. It also can be adjusted to provide level support on any uneven ground. Check out the Camco 43675 Folding Step for a sturdy metal option that can be stored easily and is a bit cheaper. The Mr. Heater Little Buddy Heater is another excellent tent heater model. We recommend this model for small to average tent sizes like a 4 person to 6 person tent. This tent heater is also exactly the right heater for an ice fishing tent. Like our top pick. the features that make this such a safe tent heater is the Oxygen Depletion Sensor (ODS) and accidental tip-over safety shut-off. While these are great safety features, we recommend reading all of the instructions carefully and making sure your camping tent is properly vented. Additional features include: 3,800 BTU per hour (runs approximately 4-5 hours off of a 1 lb. propane cylinder). Heats up to 95 sq. ft. One button ignition on function. 8in round stand uses little floor space. Connects directly to one 1 lb. disposable propane cylinder. Quiet, clean, odor-free operation. The Mr. Heater Little Buddy Heater is another excellent tent heater model. We recommend this model for very large tents like wall tents, campers, and even work great as propane heater for a tiny house or a cabin up to 450 sq. ft. An integrated fan increases the heating capacity of this unit, blending radiant and convection style heat to give you the best of both worlds. Like our top pick. the features that make this such a safe tent heater is the Oxygen Depletion Sensor (ODS) and accidental tip-over safety shut-off. While these are great safety features, we recommend reading all of the instructions carefully and making sure your camping tent is properly vented. Additional features include: 4,000, 9,000, or 18,000 BTU per hour. For use with propane gas. Heats up to 450 sq. ft. Single control start knob and includes a Piezo igniter. Hi-Med-Low heat settings. Swivel regulators. Connects to two 1 lb. cylinders or to a 20 lb. cylinder with optional hose. Fan operates on 4 – D batteries or AC adapter, both sold separately. If you’d prefer something other than a propane tent heater or electric/battery tent heater, there is always the tent wood stove. 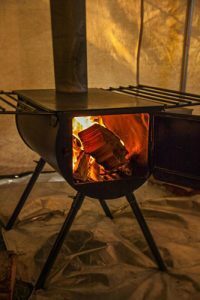 Wood burning tent stoves require some specifics when using with a tent. 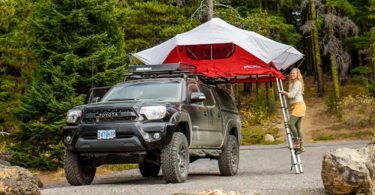 If you’re looking for a tent to use with a wood stove, we recommend looking at our best canvas tent article which which confirms which of our picks is a tent with stove jack. We fell the Camp Chef Alpine Heavy Duty Cylinder Stove is your best option for a tent stove. 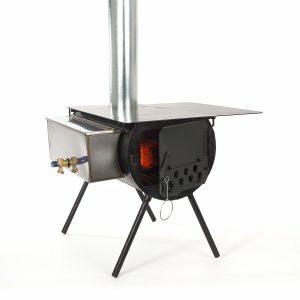 The Camp Chef website describes the tent stove as: “There is no fiddling around after purchase trying to find a damper, internal log grate, spark arrestor, or accessory shelves. These items in addition to a five-piece nesting pipe are included with our Alpine Cylinder Stove package. Of all the wood burning tent stoves for sale, the American made Colorado Cylinder Stoves Alpine Package might be the ultimate. It is more expensive than most options, but the features might be worth it for you. The Colorado Cylinder Stoves website says the following: The Alpine stove is made of heavy 10 and 12 gauge steel, and is reinforced under the top and door to prevent warping. The water tank is made of 20 gauge stainless steel and is welded water tight. All edges have been hemmed over for safety and rigidity.